Paxymer gave a speech on innovation and substitution on the topic “Chemicals management – from compliance to USP”. How chemicals management aspects can create value to the business. Covering the complex interplay that forced innovation creates in the supply chain and how OEMs set the agenda for the entire supply chain. The innovation processes today is typically an interplay in the supply chain. Especially with the increasing complexity that companies are facing. An important source for innovation is legislation or regulation that drive substitution. Outer pressure can be an important factor to propagate innovation through the supply chain – especially in B2B scenarios or where products are not easily perceived by consumers. If companies stop at compliance they are likely to have to go through the process often as legislation develops and also risk regrettable substitution. Instead of settling for mere compliance companies can instead use the push from legislators as a spark for actual innovation, a spark for creating unique selling points (USPs). Paxymer was one of the invited speakers at Nordic chemicals summit along Mattio Vaino from ECHA, Achim Halpaap from UNEP a number of EC members and Entrepreneurs and OEM/OMMs from across Europe. 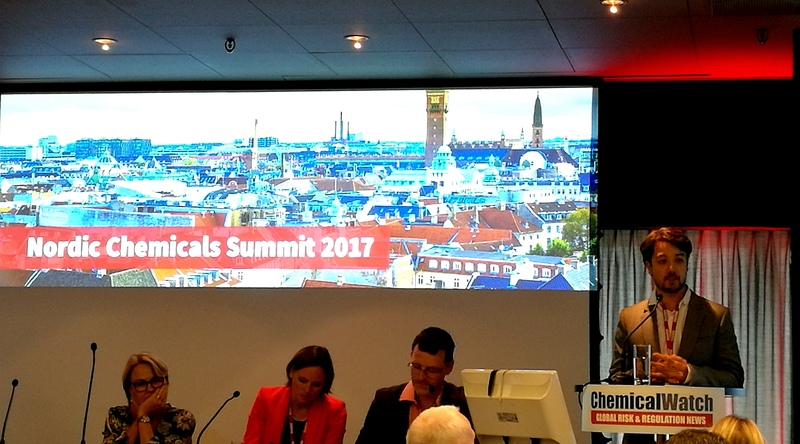 The summit was held in Copenhagen and hosted by Chemicals Watch.